Here is a selection of guitars that I have repaired, refinished, custom built and owned. 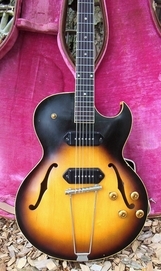 1956 Gibson ES-225 Single Pickup Model that I purchased with a broken peghead. This was an E-Bay guitar stripped of all it's components. I always wanted of these since high school. This is the guitar that got me into the business. I repaired the head stock and found vintage replacement parts. This my first Gibson ES-295. 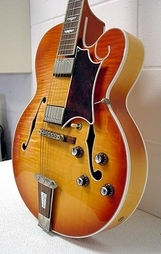 This 1957 model was complete except for the missing floral pickguard. 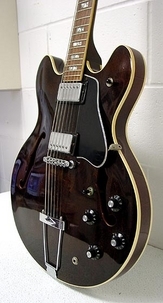 When Gibson wanted over $450.00 to make me one, I went into the pickguard business. I reproduced it from my Gibson 1952 ES-295. This Japanese 1970 Ventura hollow body came to me in need of a pickguard and pickup replacement. The customer didn't like the sound and the pickups were replaced. Someone had installed 1970's Gibson Patent Pending LP pickups. 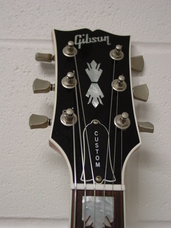 The were replaced and later installed in a Les Paul Goldtop that I built. 1976 Gibson ES-335 TD used as my main guitar during the band years. My 1958 Gibson ES-225 twin pickup guitar before I cleaned it up and made a pickguard for it. 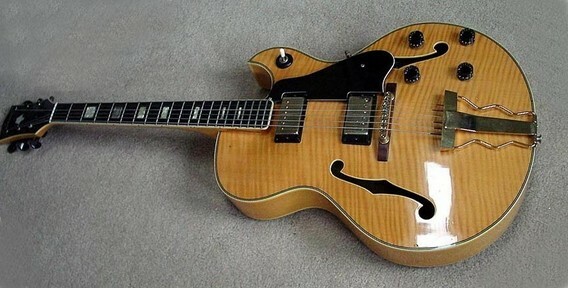 Gibson Tal Farlow. Beautiful Guitar. I don't remember the year. This is a hollow body Les Paul I built as I had these 70's Gibson pickups and needed to put them somewhere. It's based on a 1957 with one of my custom floral pickguards. This Hofner 80's Les Paul with a tele shaped peghead came to me in need of electrical work, pickguard and general set-up.